The benefits and rewards for developing and maintaining a corporate social responsibility program are not only numerous, they’re well discussed. In fact, our very own blog and resources clearly lay out all a company and its workforce have to gain from one. However, it’s the community impact that most accurately shows a CSR program’s reward. We typically turn to impact and sustainability reports to communicate numerical reach with everyone from social media followers to investors. Check out how @Nike, @CiscoNetAcad & @HondaInclusion brought life to their #CSR impact reports:Tweet This! Nike’s video shows the story behind their company’s ethical practices through video footage of recycled materials becoming their products. They explain and present the green processes being used in their own factories, so consumer and investor alike watch waste become shoes. The video doesn’t feature a single number, but it enhances every single stat they provide in their report and on their site. This video is cool and creative and definitely took time to create. The lesson here isn’t that you need a huge video production crew, but that you have a living breathing company that’s making an impact every day. In the case of Nike, we get a glimpse into a real process in their actual factory, which shows transparency in how materials are gathered and used. Viewers have an understanding that every product they buy is directly connected to that sustainable process displayed. And the best part is any company can accomplish the same thing through a beautiful video or a simple, candid picture. 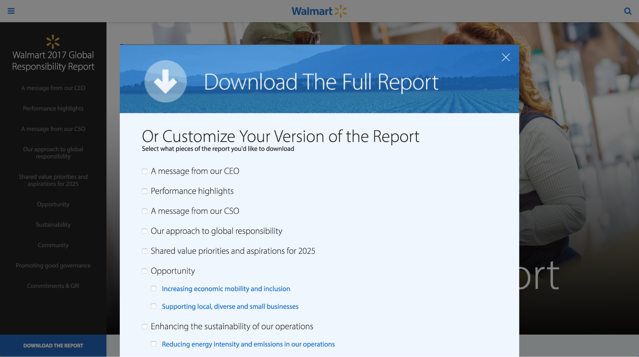 When viewers find Wal-Mart’s global responsibility report, they are given the option to click through the sections they are most interested in reading. If they want to download the report, they are presented the option to click only the sections they want to include in the PDF. This is great for your team who might correspond with donors or non-profits, but also for outside audiences like clients and customers. It’s just another way for audiences to tailor their own experience, quickly seeing how you met their specific interests. If your organization cannot segment your impact information in such an interactive manner, consider your report’s audiences. Organize the document so it’s clearly segmented for your viewer to read and your team to collect information. This can easily be done by focusing on the values of your CSR program and tailoring your website and messaging. Honda’s Get Well Card video may focus on a specific project they held on a single day, but the reach is limitless and the story is timeless. Not only did it explain a program they built, it featured people who participated both in its creation and reception. 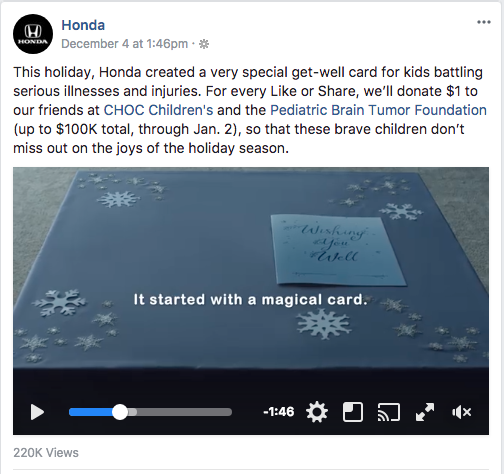 And as the Facebook post shows, Honda grew the return of the video further by donating more funds to the facility and cause by tying donations to social media. Pulling from the personalization lesson above, you can see that Honda highlighted specific details of their CSR plan and used it to fuel their campaigns. Don’t be afraid to use clips and snapshots of past events to push the boundaries of your upcoming efforts. Additionally, include content like this on your site. It will help paint a picture around who you are as a community support, employer and company. That means a better impression on participants like non profits, employees, customers and potential candidates. The Coca-Cola sustainability infographic uses its 2016 report to build a simplified, yet impactful visual of their numbers. This is a great way for the company to share a quick summary of what was accomplished by their work. As Bea Perez, their Chief Public Affairs, Communications and Sustainability Officer mentions, the graphic not only communicates important information with the viewer quickly, it invites them to start a conversation. Infographics can bring numbers to life and add the chance to show off company branding, but that’s not the only way to make a report digestible. Pull interesting numbers or big accomplishments from your report and highlight them on the site. Even sharing them as quick social media posts can start the conversation around your own efforts. Remember, the conversation you create can further current and future impact. @CocaColaCo & @WalmartAction are expert #CSR storytellers. Here’s how you can be too:Tweet This! Cisco International teamed up with the US Agency for International Development (USAID), World Learning and the Mexican Secretariat of Public Education to create entrepreneurship training programs. Through highlighting one participant’s journey, Cisco was able to create a moving blog article that featured a branch of their CSR and how it impacts their industry and the world. Sometimes it’s hard to look at a micro level when you want to make macro changes. Dollar signs and percentages don’t touch the heart or inspire the way a small connection can. Zero in on your impact stories and reports by capitalizing on the simplicity of blogs. Blogs make it easy to tell stories from a million perspectives, so you can cater your focus by location and community, industry or a family/person. Those unique and local perspectives draw in others that identify closely with the area, field or background, again drawing a connection between CSR reports and impacts. Impact is an effect made. An influence. An inspiration. The best way to capture and share impact is through strong storytelling and a solid set of numbers. Giving an inside look to events and processes as well as recounting personal narratives all provide color to accomplishments of your CSR that surpass black and white numbers. However, tracking and reporting CSR initiatives is still crucial to your investments. With CyberGrants CSR software, tracking and reporting is as simple as ever, providing more bandwidth to focus on the heart of impact: the community. Download our CSR storytelling guide to begin building your story today.